On our previous Algonquin canoe trips, we’d seen only one moose. But we’d found plenty of evidence that they had been around. And quite a few hoof prints too. 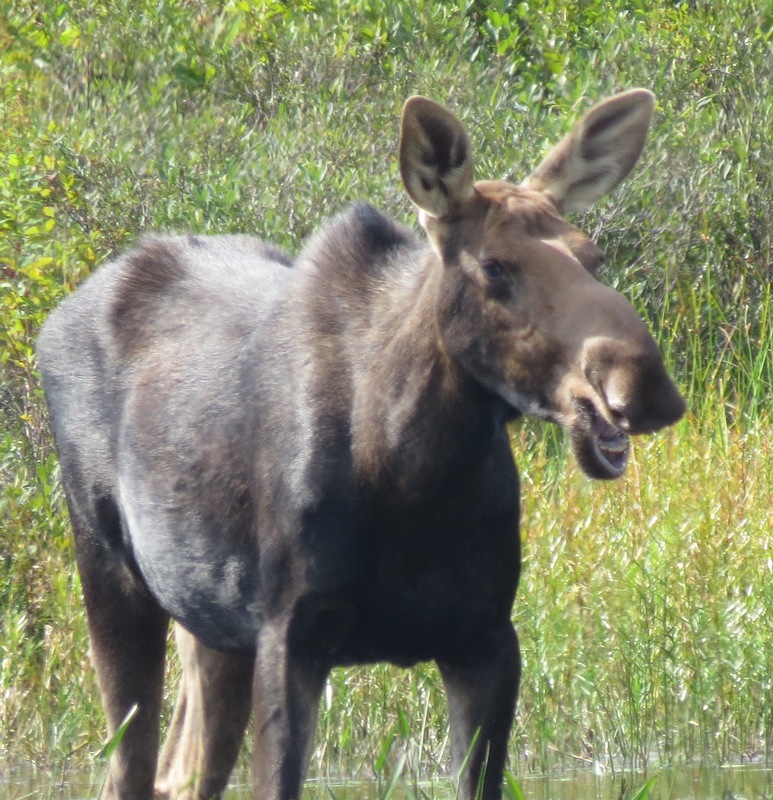 A moose near our Pen Lake campsite laughs at one of Ken’s jokes. Overall, there was no shortage of wildlife. Good or bad. We encountered moose, otters, eagles, an osprey, a Coopers hawk, turtles, ducks, a belted kingfisher, double-breasted cormorants, barred owls, a northern saw-whet owl and an emperor penguin. (We later learned that the penguin was actually Ken wearing a costume.) It was almost as if the animals were materializing on cue. Ken and I began to suspect that our naturalist friend Steve had arranged it all ahead of time. Steve wouldn’t take credit for it, nor would he take the blame for the chipmunks and red squirrels. They were insufferable. At one point, a chipmunk (otherwise known as rats with racing stripes) came streaking out of nowhere and executed a flying tackle on Ken’s pop tart, which had been sitting atop a log. The chipmunk and the pop tart tumbled in the dirt in front of the campfire. Seeing what had happened, I lunged for the little beast. In the process, I scooped up the pop tart, salvaging it under the international three-second rule. Just to be sure, I wiped it on my pant leg, which was probably dirtier than the ground. 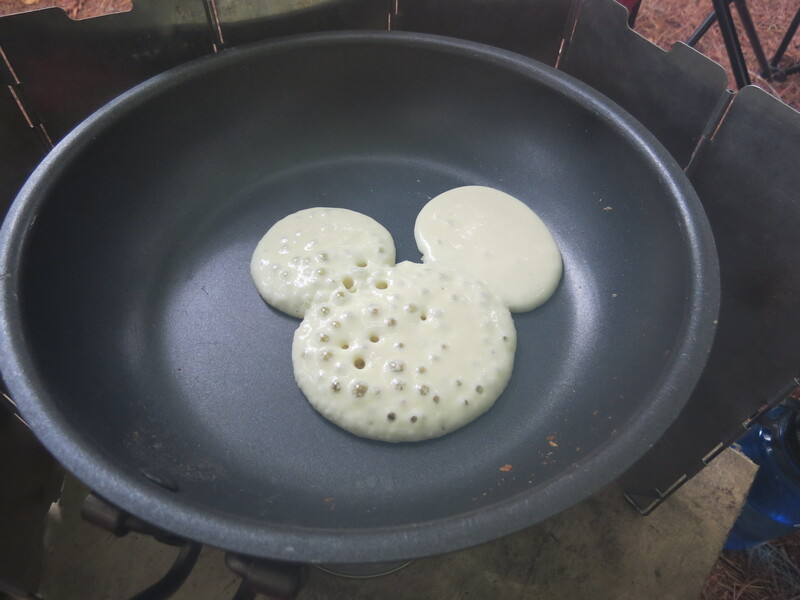 My experiment with making pancakes on a trail stove worked so well, I was able to take special requests. Mickey Mouse turned out OK. The loon-shaped pancake not so much. I chased the chipmunk around the campsite, but it managed to stay inches away from my thundering boots. This became a standard routine around mealtime. For the most part, we prevailed. On our final night at Algonquin, one of the little buggers snuck up on Steve’s fig newton while he was preoccupied and carted it off. A couple of women whose paths kept crossing with ours weren’t quite so lucky. They had attached their bear-proof barrel to a tree, instead of suspending it in mid-air with a bear rope. A red squirrel gnawed a hole in it. We first encountered the women – Sue and Heather – on our first day there, while making the portage from Rock Lake to Pen Lake. They appeared to be overwhelmed at the time, which led us to speculate that maybe they were in over their heads. We saw them late the next day. This time, Steve, Ken and I had made the rounds of Rock, Galeairy and Night lakes on a day trip. It was on Night Lake that we saw a moose and her calf, the first of two such sightings. On the one-mile portage from Night Lake to Pen Lake, we ran into Sue and Heather again. This time they were taking a late afternoon stroll from their Pen Lake campsite to Night Lake. We told them about the moose and her calf. We later learned, on our third encounter, that they also ended up seeing them. They invited us to check out the site and we got to talking camping gear. They had a gravity fed water filter, which seemed like an improvement over our hand-pump model. Steve was intrigued — we all were really — with their stick-burning cookstove. In addition to cooking with twigs, thus saving the weight and expense of propane canisters, it also used heat energy to generate electricity to charge cell phones. In talking with them and seeing their setup, it was clear that we initially misjudged them. They were capable outdoors women and kindred spirits. It was while Steve, Ken and I were paddling across Pen Lake to our campsite for the final day and night that we spotted our second moose and calf. Steve discusses a fungus he found while Ken holds up an inchworm for scale. Enough about the fauna; the flora was also spectacular. 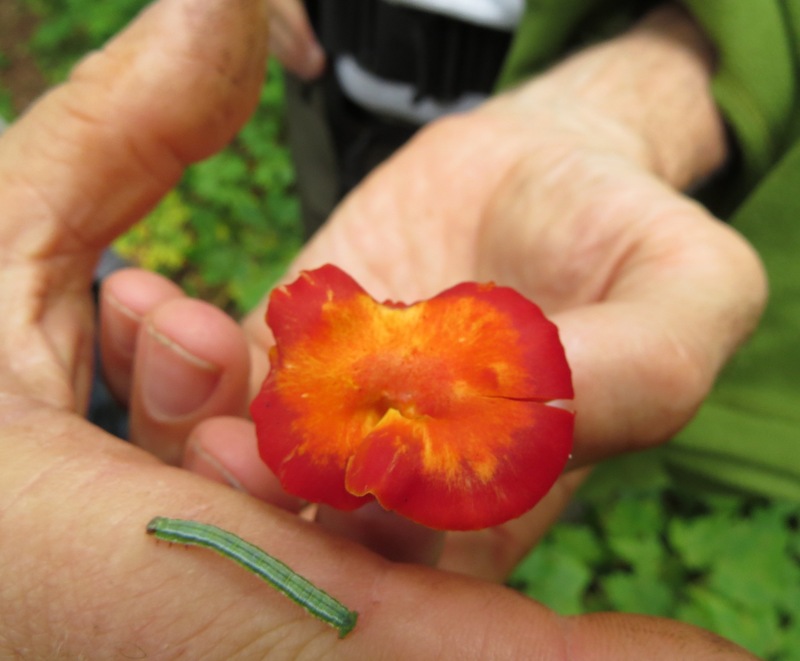 Steve managed to do a lot of botanizing and came up with a few lifetime firsts – as he always seems to do. Exploring with Steve is a special part of these trips because he’s a wealth of information and enjoys sharing it. Otherwise, the plants, critters and other natural phenomenon, while awe-inspiring, would remain nameless to me. He’s also a veteran Algonquin tripper, with nearly three decades of experience. Ken has also done a lot of trips and I’m grateful that, three years ago, he invited me to come along. Ken adds another dimension to the trips with his creativity. An artist, Ken fashions objects out of found objects. His standard fare includes a necklace sculpture and a small bench. Ken also makes other small sculptures using abandoned grills, natural materials and debris left by campers. One year he made puppets out of moose scapulae. The past two years he made Sun King sculptures out of small grills. This year, he credited what I dubbed “Son of Sun King” with bringing good weather. Which doesn’t explain the rain we had last year with the original Sun King reigning (pun intended) over our campsite. 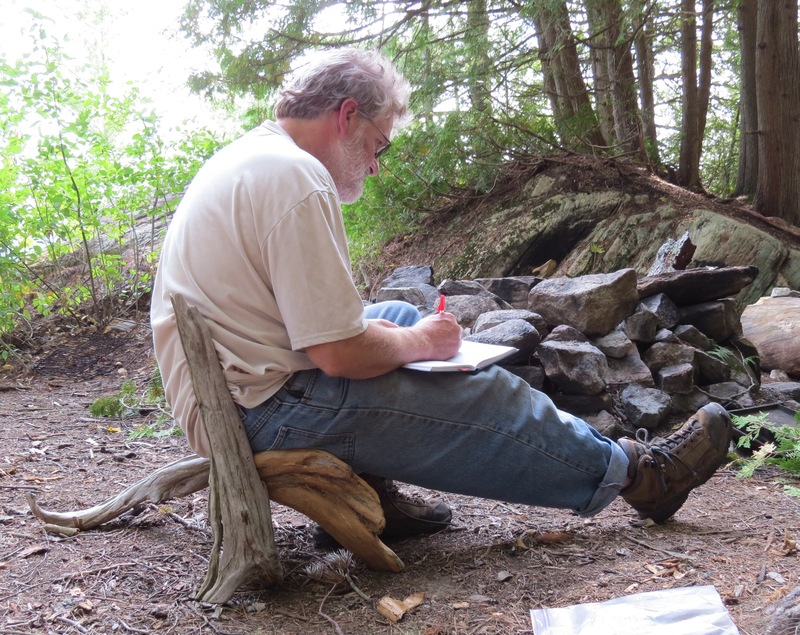 Ken sits on the bench he made while making another entry in his journal. As Steve put it, Ken outdid himself with this year’s bench, which he fashioned out of pieces of driftwood. Ken did an amazing job highlighting the shape and visual texture of each piece, cobbling them into a graceful sculpture. Ken does most of the work on his art projects while Steve and I are taking our afternoon naps. Which is a shame, because I’d like to see how he does it. But not enough to deter me from sawing a little wood of my own.